A polarized electorate and alarming policy reversals reduce confidence at home and abroad in US global leadership. As the Trump administration embarks on a new course in foreign policy within its first year in office, roughly two-thirds of Americans report believing that the United States is less respected by other countries than it has been in the past, according to a recent Pew Research Center poll of US adults. The public has long held this view, including majorities when Barack Obama and George W. Bush held office. This perception of how the United States is seen around the world has also long been a partisan issue. 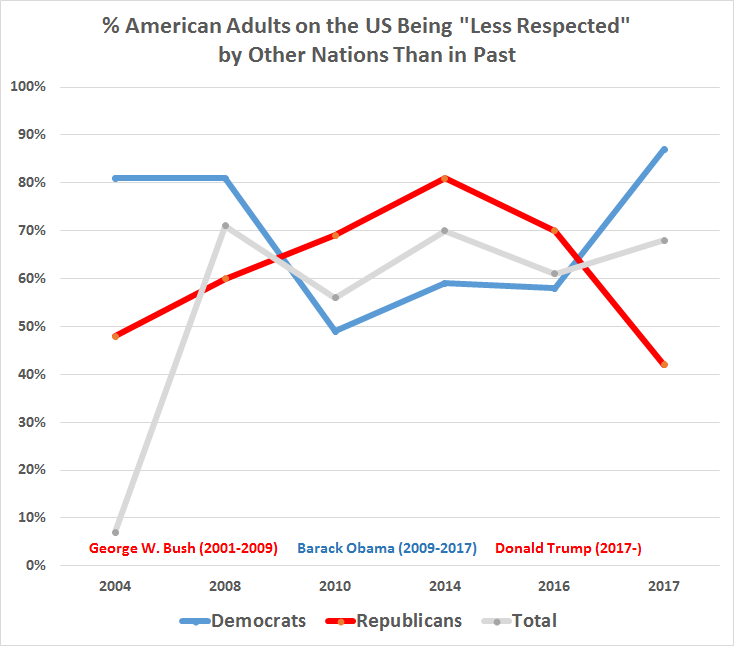 However, there are substantial changes in how Republicans and Democrats view the relative level of global respect for the nation. Today, 42 percent of Republicans and Republican-leaning independents say the United States is less respected by other countries than in the past, the lowest percentage expressing this view in more than a decade. A greater share of Republicans, 29 percent, say the nation is more respected internationally today than did so during Obama’s presidency or Bush’s second term, and 28 percent suggest this constitutes a major problem for the country. At the same time, even at various points when Obama was in office, majorities of Democrats viewed the US as less respected internationally; for example, 58 percent said this in 2016. Now, 87 percent of Democrats and Democratic-leaners say the US is less respected than in the past, with 70 percent saying this is a major problem. Concern about the US image abroad may have some basis in fact. Results from the center’s 37-nation spring survey within months of Donald Trump’s ascendancy found that, globally, a median of 49 percent had a favorable opinion of the US, down from 64 percent at the end of the Obama administration. The US image also suffered during the tenure of George W. Bush, when foreign publics questioned the wisdom of the Iraq war and the US approach to combating terrorism. Today’s resurgent doubts about the United States can be traced, in part, to the lack of public confidence in Trump and popular opposition to his stand on issues like climate change, free trade and immigration. History suggests anti-Americanism can have consequences for US foreign policy objectives, though it’s too soon, yet, to judge the impact of souring views of Uncle Sam. The decline in US favorability has occurred in most regions of the world. Views of the nation are down 36 percentage points in Mexico, 30 points in Ghana and 22 points in Canada. Across Europe there have been large shifts in public views of the US: Favorable opinion is down 28 points in Spain, 26 points in the Netherlands and 22 points in Germany. Clear majorities in those nations now hold unfavorable views. And, despite the “special relationship” between the United States and the United Kingdom, only 50 percent of the British view the US favorably, down 11 points from 2016. Latin Americans are lukewarm, at best, toward the United States. About half of Colombians, Peruvians, Brazilians and Venezuelans express a positive attitude. Mexicans are unfavorable by more than two to one – 30 percent positive, 65 percent negative. In the Middle East, around eight in 10 Israelis are positive toward the United States. But they stand isolated in the region. About a third of Lebanese and roughly a quarter of Tunisians report a favorable opinion of America. Overwhelming majorities in Turkey and Jordan voice an unfavorable view. The United States remains popular in Asia, although there are signs of slippage. Support is up in Vietnam, 84 percent, up 6 points, while positive but declining in the Philippines, 78 percent, down 14 points, and South Korea, 75 percent, down 9 points. A majority of Japanese, 57 percent, are favorable toward the United States, but that support is down 15 points. About half of Australians are positive: 48 percent, down 12 points. A similar portion of Indians – 49 percent, down 7 points – express a favorable view. In sub-Saharan Africa more than half the respondents in all six nations surveyed offer a favorable assessment of the United States. The most widespread support is in Nigeria at 69 percent. But intensity of positive opinion has waned in the six African societies since 2015. A notable exception to the near universal decline in US standing: Russia, where positive views are up 26 points since 2016 to 41 percent today. Since 2002, when Pew Research first asked about America’s image abroad, favorable opinion of the United States has frequently tracked with confidence in the president. Views of Trump are significantly lower than those of Obama at the end of his term. A median of 22 percent has confidence in Trump to do the right thing when it comes to international affairs compared with a median of 64 percent who expressed confidence in Obama. The decline is especially pronounced among the populations of some of America’s closest allies: Sweden, down 83 points; Germany, 75 points; France, 70 points; the United Kingdom, 57 points; and Japan, 54 points. And note, this survey was conducted before the recent spat between British Prime Minister Theresa May and Trump over his retweeting controversial anti-Muslim videos posted by the far-right Britain First Party. In only two countries does Trump get higher marks than Obama at the end of his tenure: Israel with 56 percent confidence, up 7 points, and Russia with 53 percent, up 42 points. Lack of confidence in Trump is linked to public opposition to some of his signature policies. A median of roughly three-quarters of those surveyed oppose Trump’s vow to build a wall on the US border with Mexico to limit unauthorized immigration. The Pew Research survey was conducted before Trump officially announced that the United States would pull out of the Paris climate change accord. Nonetheless, a median of 19 percent support the US backing away from such accords. There is a similarly low level of support for the US rejecting major trade agreements. Trump pulled the United States out of the Trans-Pacific Partnership early in his administration. Opposition to the nation withdrawing from climate and trade agreements is especially strong in European nations polled. A possible new wave of anti-Americanism may have consequences on policies in the US and abroad, and the past suggests that foreign leaders and governments may add anti-Americanism to their political calculus. In 2003, when just 25 percent of Germans had a favorable opinion of the United States, then German Chancellor Gerhard Schroeder refused to go along with the US-led invasion of Iraq after relying on anti-American sentiment in his successful 2002 reelection campaign. Similarly, the Turkish Parliament refused to allow American troops to invade Iraq from the north, a decision made as 12 percent of Turks saw Uncle Sam favorably. Anti-Americanism alone may not have determined either policy decision, but it provided context as decisions were made. Sometimes anti-Americanism backfires as political opportunity. In the 2017 German election, Social Democrat leader Martin Schulz attempted to use anti-Americanism to rally support for his party. In the end, Social Democrats fared worse than in any recent German election. Schultz may have misread public opinion. The Pew Research Center finds that despite mistrust of Trump and falling opinion of the United States, Europeans have not lost faith in the nation as an ally. Most, including 65 percent of Germans polled and 60 percent of French, remain confident that Washington would use military force to defend a NATO member involved in a serious military conflict with Russia. So history leaves open the question of how anti-Americanism may influence domestic and international politics. New answers may be on the horizon, however, with the image of the United States widely suffering once again and confidence in the US president at or near historic lows in key countries. And the new administration is only a year old. *Bruce Stokes is director of global economic attitudes at the Pew Research Center. YaleGlobal Online is a publication of the Whitney and Betty MacMillan Center for International and Area Studies at Yale. The magazine explores the implications of the growing interconnectedness of the world by drawing on the rich intellectual resources of the Yale University community, scholars from other universities, and public- and private-sector experts from around the world. The aim is to analyze and promote debate on all aspects of globalization through publishing original articles and multi-media presentations. YaleGlobal also republishes, with a brief comment, important articles from other publications that illuminate the many sides of this complex phenomenon. To the extent permitted by copyright arrangements, YaleGlobal archives such articles and makes them available for search and retrieval. 50/60 years ago when I was a kid everybody liked America. You were very proud to say yes I am an American. Today who likes us except countries who want to rip something off of us? What/.who changed us? The middle east realizes the jig is up, no more dragging America into proxy wars against militias of farmers and cave dwellers to deplete resources. Israel sees the writing on the wall and Lebanon is starting to get the picture – PALESTINE DOESN’T EXIST, IT WAS STOLEN FROM THE LEBANESE who are canaanite descendants proved by DNA, and the ones who founded Jerusalem.